Martin Van Buren ( December 5, 1782 – July 24, 1862), nicknamed Old Kinderhook, was the eighth President of the United States. He was a key organizer of the Democratic Party, a dominant figure in the Second Party System, and the first president who was not of English, Irish, or Scottish descent. He is also the only president not to have spoken English as his first language, but rather grew up speaking Dutch. He was the first of a series of eight presidents between Andrew Jackson and Abraham Lincoln who served one term or less. He also was one of the central figures in developing modern political organizations. As Andrew Jackson's Secretary of State and then Vice-President, he was a key figure in building the organizational structure for Jacksonian democracy, particularly in New York State. However, as a President, his administration was largely characterized by the economic hardship of his time, the Panic of 1837. Between the bloodless Aroostook War and the Caroline Affair, relations with Britain and its colonies in Canada also proved to be strained. Whether or not these are directly his fault, Van Buren was voted out of office after four years, with a close popular vote but a rout in the electoral vote. In 1848 he ran for president on third party ticket, the Free Soil party. Van Buren was born in the village of Kinderhook, New York, approximately 25 miles south of Albany, the state capital, as the third of five children. His great-great-great-great-grandfather Cornelis had come to the New World in 1631 from the Netherlands. His father was Abraham Van Buren ( February 17, 1737– April 8, 1817), a farmer and popular tavern-master. His mother was Maria Goes Hoes ( February 27, 1743– February 16, 1817), a widow who had three sons from a previous relationship. Van Buren was educated at the common schools and at Kinderhook Academy. In 1796, he began the study of law, completing his preparation in 1802 in New York City, where he studied under William Peter van Ness. In 1803, he was admitted to the bar and continued an active and successful practice for 26 years. On February 21, 1807, he married Hannah Hoes, a maternal cousin. His practice made him wealthy and paved the way for his entrance into politics. New York politics after 1800, the year of the election of Thomas Jefferson and the downfall of the Federalists, were particularly intense and wretched. The Democratic-Republicans were divided into three factions: followers of George Clinton (and later of his nephew, De Witt Clinton), Robert R. Livingston, and Aaron Burr. Federalist control after 1799 depended upon coalition with one or other of these groups. Van Buren, who allied himself early with the Clintonians, was surrogate of Columbia County from 1808 until 1813, when he was removed. In 1812, he entered the state Senate, and he also became a member of the Court for the Correction of Errors, the highest court in New York until 1847. As a member of the state Senate, he supported the War of 1812 and drew up a classification act for the enrollment of volunteers. He broke with DeWitt Clinton in 1813 and tried to find a way to oppose Clinton's plan for the Erie Canal in 1817. Van Buren supported a bill that raised money for the canal through state bonds, and the bill quickly passed through the legislature with the help of his Tammany Hall compatriots. When the 96-mile stretch of the Erie Canal from Utica to Syracuse, New York opened in 1819, Van Buren tried to take credit away from Clinton and keep it for himself. His supporters guaranteed money for the canal in 1821, and they drove Clinton from the governor's office. Van Buren's attitude towards slavery at the moment was shown by his vote, in January 1820, for a resolution opposing the admission of Missouri as a slave state (though he himself was a slave owner). In the same year, he was chosen a presidential elector. It is at this point that Van Buren's connection began with so-called "machine politics". He was the leading figure in the " Albany Regency," a group of politicians who for more than a generation dominated much of the politics of New York and powerfully influenced those of the nation. The group, together with the political clubs such as Tammany Hall that were developing at the same time, played a major rôle in the development of the " spoils system" a recognized procedure in national, state and local affairs. Van Buren did not originate the system but gained the nickname of "Little Magician" for the skill with which he exploited it. He served also as a member of the state constitutional convention, where he opposed the grant of universal suffrage and tried to keep property requirements. In February 1821, Van Buren was elected to the United States Senate. 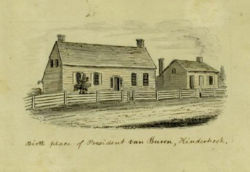 Van Buren at first favored internal improvements and in 1824 proposed a constitutional amendment to authorize such undertakings. The next year, however, he took ground against them. He voted for the tariff of 1824 then gradually abandoned the protectionist position, coming out for "tariffs for revenue only." In the presidential election of 1824, Van Buren supported William H. Crawford and received the electoral vote of Georgia for vice-president, but he shrewdly kept out of the acrimonious controversy which followed the choice of John Quincy Adams as President. Van Buren had originally hoped to block Adams' victory by denying him the state of New York (the state was divided between Van Buren supporters who would vote for William H. Crawford and Adams' men). However, Representative Stephen Van Rensselear swung New York to Adams and thereby the 1824 Presidency. He recognized early the potential of Andrew Jackson as a presidential candidate. After the election, Van Buren sought to bring the Crawford and Jackson followers together and strengthened his control as a leader in the Senate. Always notably courteous in his treatment of opponents, he showed no bitterness toward either John Quincy Adams or Henry Clay, and he voted for Clay's confirmation as Secretary of State, notwithstanding Jackson's " corrupt bargain" charge. At the same time, he opposed the Adams-Clay plans for internal improvements and declined to support the proposal for a Panama Congress. As chairman of the Judiciary Committee, he brought forward a number of measures for the improvement of judicial procedure and, in May 1826, joined with Senator Thomas Hart Benton in presenting a report on executive patronage. In the debate on the " tariff of abominations" in 1828, he took no part but voted for the measure in obedience to instructions from the New York legislature—an action which was cited against him as late as the presidential campaign of 1844. Van Buren was not an orator, but his more important speeches show careful preparation and his opinions carried weight; the oft-repeated charge that he refrained from declaring himself on crucial questions is hardly borne out by an examination of his senatorial career. In February 1827, he was re-elected to the Senate by a large majority. He became one of the recognized managers of the Jackson campaign, and his tour of Virginia, the Carolinas, and Georgia in the spring of 1827 won support for Jackson from Crawford. Calling it a "substantial reorganization of the old Republican party," Van Buren helped create a grassroots style of politicking that we often see today. At the state level, Jackson's committee chairmen would split up the responsibilities around the state and organize volunteers at the local level. "Hurra Boys" would plant hickory trees (in honour of Jackson's nickname, "Old Hickory") or hand out hickory sticks at rallies. Van Buren even had a New York journalist write a campaign piece portraying Jackson as a humble, pious man. "Organization is the secret of victory," an editor in the Adams camp wrote. "By the want of it we have been overthrown." In 1828, Van Buren was elected governor of New York for the term beginning on January 1, 1829, and resigned his seat in the Senate. However on March 5, he was appointed by President Jackson as Secretary of State, an office which probably had been assured to him before the election, and he resigned the governorship. He was succeeded in the governorship by his Lieutenant Governor, Enos T. Throop, a member of the regency. As secretary of state, Van Buren took care to keep on good terms with the "kitchen cabinet," the group of politicians who acted as Jackson's advisers. He won the lasting regard of Jackson by his courtesies to Mrs. John H. Eaton ( Peggy Eaton), wife of the Secretary of War, with whom the wives of the cabinet officers had refused to associate. He did not oppose Jackson in the matter of removals from office but was not himself an active "spoilsman". He skillfully avoided entanglement in the Jackson- Calhoun imbroglio. No diplomatic questions of the first magnitude arose during Van Buren's service as secretary, but the settlement of long-standing claims against France was prepared and trade with the British West Indies colonies was opened. In the controversy with the Bank of the United States, he sided with Jackson. 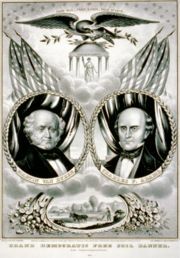 After the breach between Jackson and Calhoun, Van Buren was clearly the most prominent candidate for the vice-presidency. In December 1829, Jackson had already made known his own wish that Van Buren should receive the nomination. In April 1831, Van Buren resigned from his secretary of state position, though he did not leave office until June. In August, he was appointed minister to the Court of St. James (United Kingdom), and he arrived in London in September. He was cordially received, but in February, he learned that his nomination had been rejected by the Senate on January 25. The rejection, ostensibly attributed in large part to Van Buren's instructions to Louis McLane, the American minister to England, regarding the opening of the West Indies trade, in which reference had been made to the results of the election of 1828, was in fact the work of Calhoun, the vice-president. And when the vote was taken, enough of the majority refrained from voting to produce a tie and give Calhoun his longed-for "vengeance." No greater impetus than this could have been given to Van Buren's candidacy for the vice-presidency. After a brief tour on through Europe, Van Buren reached New York on July 5, 1832. In May, the Democratic convention, the first held by that party, had nominated him for vice-president on the Jackson ticket, despite the strong opposition to him which existed in many states. No platform was adopted because the widespread popularity of Jackson was being relied upon to succeed at the polls. His declarations during the campaign were vague regarding the tariff and unfavorable to the United States Bank and to nullification, but he had already somewhat placated the South by denying the right of Congress to abolish slavery in the District of Columbia without the consent of the slave states. In the election of 1832, the Jackson-Van Buren ticket won by a landslide. When the election of 1836 came up, Jackson was determined to make Van Buren, his personal choice, president in order to continue his legacy. Martin Van Buren's only competitors in the 1836 election were the Whigs, who were badly split. They were split into several regional candidates. William Henry Harrison hoped to receive the support of the Western voters, Daniel Webster had strength in New England, and Hugh Lawson White had support in the South. In May 1835, Van Buren was unanimously nominated by the Democratic convention at Baltimore. He expressed himself plainly on the questions of slavery and the bank at the same time voting, perhaps with a touch of bravado, for a bill offered in 1836 to subject abolition literature in the mails to the laws of the several states. Van Buren's presidential victory represented a broader victory for Jackson and the party. Martin Van Buren announced his intention "to follow in the footsteps of his illustrious predecessor," and retained all but one of Jackson's cabinet. Van Buren had few economic tools to deal with the economic crisis of 1837. He succeeded in setting up a system of bonds for the national debt. His party was so split that his 1837 proposal for an "Independent Treasury" system did not pass until 1840. It gave the Treasury control of all federal funds and had a legal tender clause that required (by 1843) all payments to be made in legal tender rather than in state bank notes. But the act was repealed in 1841 and never had much impact. Foreign affairs were complicated when several states defaulted on their state bonds, London complained, and Washington explained it had no responsibility for those bonds. British authors such as Charles Dickens then denounced the American failure to pay royalties, leading to a negative press in Britain regarding the financial honesty of America. The Caroline Affair involved Canadian rebels using New York bases to attack the government in Canada. On December 29, 1837, Canadian government forces crossed the frontier into the US and burned the Caroline, which the rebels had been using. One American was killed, and an outburst of anti-British sentiment swept through the U.S. Van Buren sent the army to the frontier and closed the rebel bases. Van Buren tried to vigorously enforce the neutrality laws, but American public opinion favored the rebels. Boundary disputes in May brought Canadian and American lumberjacks into conflict. There was no bloodshed in this Aroostook War, but it further inflamed public opinion on both sides. In the Amistad Case Van Buren sided with the Spanish Government to return the kidnapped slaves. Also, the " Trail of Tears" Cherokee removal in 1838 from the states of Georgia, Tennessee, Alabama, and North Carolina to the Oklahoma territory occurred. 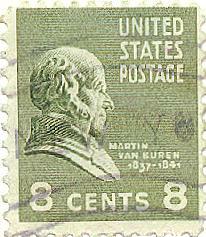 Van Buren took the blame for hard times, as Whigs ridiculed him as Martin Van Ruin. Van Buren's rather elegant personal style was also an easy target for Whig attacks, such as the Gold Spoon Oration. 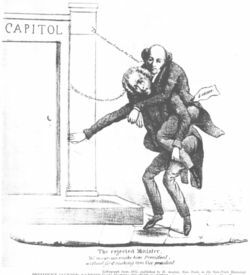 State elections of 1837 and 1838 were disastrous for the Democrats, and the partial economic recovery in 1839 was offset by a second commercial crisis in that year. Nevertheless, Van Buren controlled his party and was unanimously renominated by the Democrats in 1840. The revolt against Democratic rule led to the election of William Henry Harrison, the Whig candidate. On the expiration of his term, Van Buren retired to his estate, Lindenwald in Kinderhook, where he planned out his return to the White House. He seemed to have the advantage for the nomination in 1844; his famous letter of April 27, 1844, in which he frankly opposed the immediate annexation of Texas, though doubtless contributing greatly to his defeat, was not made public until he felt practically sure of the nomination. In the Democratic convention, though he had a majority of the votes, he did not have the two-thirds which the convention required, and after eight ballots his name was withdrawn. James K. Polk received the nomination instead. In 1848, he was nominated by two minor parties, first by the " Barnburner" faction of the Democrats, then by the Free Soilers, with whom the "Barnburners" coalesced. He won no electoral votes, but took enough votes in New York to give the state -- and perhaps the election -- to Zachary Taylor. In the election of 1860, he voted for the fusion ticket in New York which was opposed to Abraham Lincoln, but he could not approve of President Buchanan's course in dealing with secession and eventually supported Lincoln. After being bedridden with a case of pneumonia since the fall of 1861, Martin Van Buren died of bronchial asthma and heart failure at his Lindenwald estate in Kinderhook at 2:00 a.m. on July 24, 1862. He is buried in the Kinderhook Cemetery. Van Buren had several different nicknames during his lifetime, including Martin Van Ruin, Log Cabin Democrat and The Little Magician. He was also known as "The Red Fox of Kinderhook" because of his bright red hair and slyness. During Van Buren's presidential campaign of 1836 supporters popularized his nickname "Old Kinderhook," which was abbreviated as "OK." "OK Clubs" were set up. This has been argued as a possible origin of the expression " OK," although more plausible etymological explanations exist. In Gore Vidal's novel Burr, Van Buren is secretly the illegitimate son of Aaron Burr. In a popular episode of Seinfeld entitled the "Van Buren Boys" Kramer and George are threatened by a street gang called the Van Buren Boys with the secret sign of the number 8 because Van Buren was the 8th president. They apparently picked that name as he was "The meanest president". In the 2000 PBS documentary series The American President, Van Buren's voice was provided by Mario Cuomo. ( ). In the 1997 film Amistad, he was played, more conventionally, by Nigel Hawthorne. Van Buren was the first President born after the signing of the Declaration of Independence ( 1782), thus technically making him the first true American President, the first seven Presidents being born British subjects.